I’m looking for a Mothercare tan colored bear that is about 12 inches or 30 centimeters long from head to foot. He was quite tatty. The tag number was CIF A81108110, and it was made in Vietnam. It was available in Mothercare around 2002. They used to make a light colored one, which would be OK, as we could die it. My daughter had this teddy bear since before birth, and in October it went missing. She is now 7 years old. She has been distraught, and we are looking for a replacement. If anyone can help me find one, I would be enormously grateful. Is this the tan or lighter version of the bear you are looking for? Hi,I too am looking for this bear! Would you let me know where you found it please? Hello, I have a teddy just the same called Eddy. If no one wants this bear or doesn’t clame it I would gladly adopt it to be Eddy’s friend! My Eddy is very battered too but I customised him when I was very little with a baby born baby grow! Eddy is my best friend and I’m sure that he would be very grateful of a friend because when I pair up my other teddies he is always on his own. Thank you. 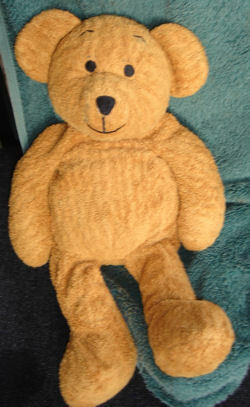 I am still looking for this tan coloured teddy bear, if there is one available my daughter would be over the moon!